If you give your sewing projects as gifts or have a small crafting business, it's wonderful to include a personalized label on the items you sew. However, if you buy labels, you often have to purchase them in quantities of several hundred. If you don't need that many and don't want to make that kind of investment, there are a couple of easy ways to can make your own gorgeous labels without spending a fortune. If you have a computer and an inkjet printer, you're already well on your way to creating custom DIY labels. The process is quick and easy, even if you don't have a lot of past experience. You can either sew the labels directly on to the item you're making, or you can sew them to a ribbon and sew the ribbon into a seam. Begin by opening your word processing program and creating a blank document. Decide on the size you want your label to be and create a box with those dimensions. Create a text box inside the label and type what you'd like the label to say. If you want to include a graphic, paste it in as well. Adjust the size and font of the text until it looks like what you have in mind. Duplicate the entire label and paste it as many times as you want. Be sure to leave space between the labels to make it easier to cut them out and have room to fold the edges under when you appliqué them to your project, if you desire. Print a test of the document using regular paper and check to make sure it looks the way you want. Load the printer fabric and print according to the manufacturer instructions, just as you would do if you were printing photos on fabric. When the ink has dried, wash, dry, and iron the fabric. Cut out the labels. If you won't be turning under the edges as you appliqué, use pinking shears to keep the edges from unraveling. If you'll be sewing them to a ribbon, do this now. If not, sew the label directly to the item you made, turning the edges under if you desire. You can also make labels on your sewing machine if your machine can do basic embroidery. Machine-embroidered labels work best for simple designs, such as initials or monograms. The style of your label may depend on how elaborate your machine is when it comes to decorative stitching. However, even many basic sewing machines can sew letters. You'll be embroidering ribbon for the label, so you'll need to decide how large you want it to be. If you want to fold it in half and sew in into a seam, make sure you double the length to account for the folding. Choose a ribbon that's wide enough to accommodate your text. Use pinking shears to cut the ribbon to the desired length. Be sure to leave about 1/4 inch extra to leave room for sewing on either side of your text. Program your sewing machine according to the manufacturer's instructions. Practice your label design on plain fabric first to make sure it will look the way you want. When you're happy with your design, sew it on the ribbon instead of the fabric. Sew the ribbon into the item you're making. 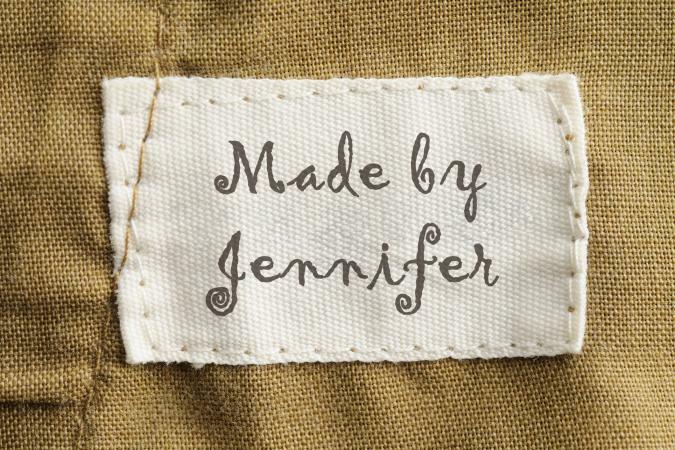 Making your own labels is a great way to add an extra personal touch to your sewing projects. Gifts will be more meaningful and handmade products more professional with the addition of beautiful labels.